Ella Briggs, an ebullient fifth grader from East Hampton with a platform centered on support for LGBTQ youth, was sworn in as “Kid Governor” Friday at the Old State House. Ella, who spoke with an eloquence and confidence beyond her 10 years, told the crowd of elected leaders that included Gov.Ned Lamont, dignitaries, and students that she learned to talk when she was only seven months old. Ella, who is a student at Ana Grace Academy of the Arts Elementary Magnet School in Avon and identifies as a lesbian, said she knew early that she couldn’t imagine marrying a man. Ella’s three-point platform includes encouraging schools and districts to establish alliances for gay students and their supporters; promoting adoption for LGBTQ youth who are homeless; and training teachers and support staff to work with LGBTQ youth. “The training will help adults in our schools prevent and respond to bullying that is based on sexual orientation, gender identity, or gender expression,” Ella said. She also hopes to start conversations around the state about what it means to accept and respect everyone, including those in the LGBTQ community, and provide action steps to bring “pride, hope and love” into schools. 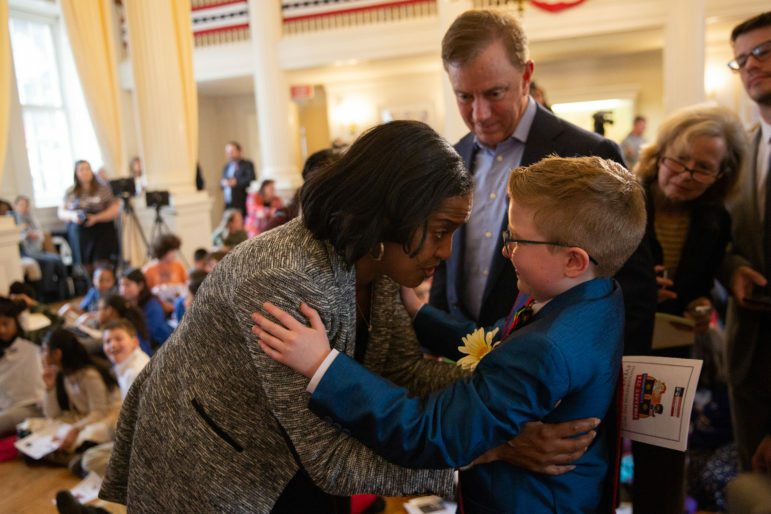 Ella, who wore an elegant blue suit with a rainbow tie and sparkling heels, was sworn into office by Secretary of the State Denise Merrill who urged all of the students in attendance to vote when they are of age. As the fourth kid governor in the state, Ella replaces Megan Kasperowski of Portland whose year-long project focused on programs to lift the spirits of cancer patients, as well as supporting cancer research. Gov. Ned Lamont encouraged the students to speak up, noting that Mozart did his first concert at age 5 and Tiger Woods broke 80 when he was 8. He said it’s often been young people “who moved the dial” by standing up for their beliefs. Hayes told the group that she is a person who asks “but why” when she sees something going on that she doesn’t understand. Hayes invited Ella to visit her in Washington, D.C.
More than 6,400 Connecticut fifth graders registered to vote in this year’s statewide election, choosing among students nominated by their classes. The program was created by the Connecticut Democracy Center — formerly the Connecticut Public Affairs Network. 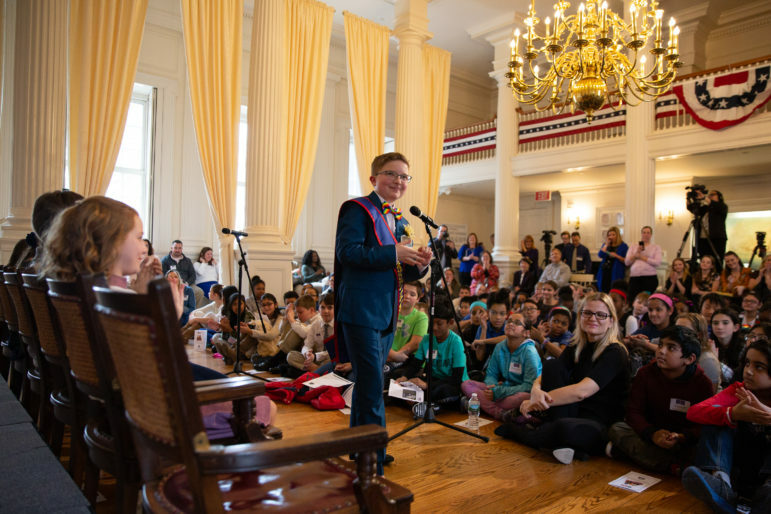 Brian Cofranceso, head of Connecticut’s Kid Governor program for the Connecticut Democracy Center, said the program teaches students about civics and the power they have to make a difference.